As new and innovative skills in therapy evolve and are discussed, self-disclosure is becoming an increasingly hot-topic of debate between different theoretical orientations (Aron, 1996; Casement, 1988; Farber, 2006; Goldstein 1997; Henretty & Levitt, 2010; Hill & O’Brien, 1999; Rogers, 1957; Windsor, Barker & McCarthy, 2011; Ziv-Beiman, 2013). Freud (1912, 1958) likened therapists to a blank canvas who “should be opaque to his patients and, like a mirror, should show them nothing but what is shown to him” (p. 118). However more contemporary approaches such as feminist and multicultural therapy promote the use of self-disclosure to strengthen the working relationship, viewed as a core element in therapy (Brown, 1994). Somewhere between these two extremes, practitioners and researchers from differing philosophies deliberate the pros and cons of self-disclosure. After reading “Opening up to disclosure” (Ruddle & Dilks, 2015), and a timely consultancy experience, I realised the paucity of research on self-disclosure in the sport psychology literature. In order to keep up with growing understanding and debate of this aspect in therapy, more time needs to be spent exploring the role of self-disclosure in the sporting context. 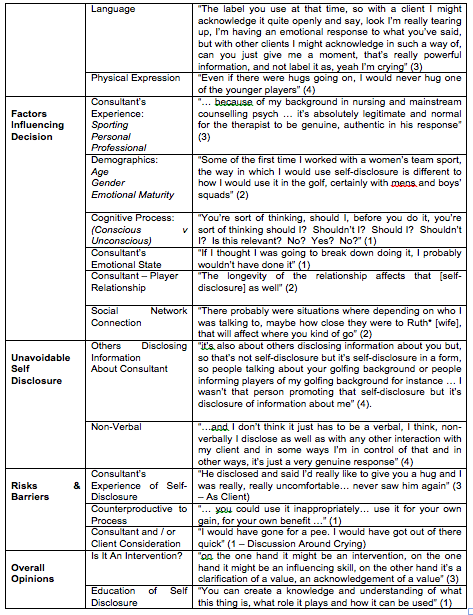 Is self-disclosure used in Sport Psychology context? 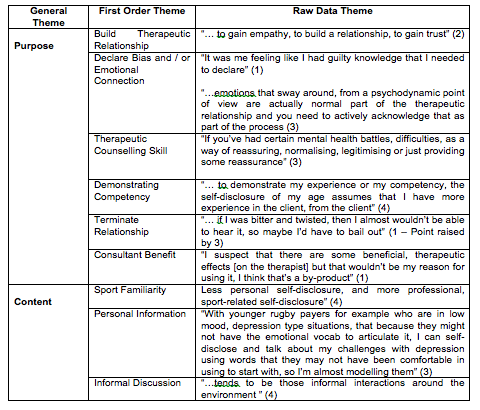 What is the content of self-disclosure in Sport Psychology? Is it recognised / accepted as an “intervention”? Themes such as normalisation, relief, enhancing the therapeutic relationship and reducing distress were drawn from the autoethnographic narrative inquiry. The role of supervision was highlighted as being vital to maintain objectivity and enable thorough debriefing. In my consultancy experience, using self-disclosure had a positive effect on the consultant-client relationship. From my personal experience and from the focus group, the overall opinion seems to lean towards self-disclosure as a positive influence. Intriguingly, the conversation around whether self-disclosure needs to be included in SPC training was incomplete and even though it was agreed that it can be valuable, only one participant explicitly stated that it constitutes a place in training programmes. My choice to self-disclose was supported by my CoS who over the years, I recognised had modelled self-disclosure in his work with me and others (Dosil, 2006). In the focus group, the SPC’s who engaged in self-disclosure had not actively sought input from a third party. Within the main themes and sub-themes drawn from the focus group, there are some clear crossovers from the SPC context to mainstream psychology. For example, purposes such as building trust and using self-disclosure as a therapeutic skill are identified in a number of research papers (Andersen & Anderson, 1985; Hill & Knox, 2001; Hill & O’Brien, 1999). Questions on whether self-disclosure is used in practice elicited more varied responses. One participant acknowledged and actively used self-disclosure as part of his practice: “I think that’s [self-disclosure] an incredibly helpful and strategic form of helping” (3). Where as the other three participants accepted self-disclosure as inevitable in practice (non-verbal, others disclosing information about the consultant) and might be used for certain purposes such as to declare bias or gain trust, but did not necessarily use it throughout the consultancy process as a conscious skill, technique or intervention. The reason for disclosing personal information appears to vary depending on level of expertise. One participant (neophyte) talked about using self-disclosure to show a level of competency, where as one of the experienced participants used self-disclosure as part of the therapeutic process to convey authenticity or to assist understanding of emotional responses in a client. The value of continuing this research is to clearly conceptualise self-disclosure in SPC and investigate the efficacy of including its teaching in to education and training programmes as a therapeutic technique or skill. Furthermore, establishing types of self-disclosure unique to the sporting context will be beneficial. In time, investigating the effectiveness of self-disclosure on athlete well-being and therefore performance will be valuable, complementing the growing interest in integrative, athlete-centred approaches to SPC. At this stage, the initial insight from a case study approach offers preliminary knowledge on the perspectives of SPC’s in a specific location at a particular point in time.